Now regular readers will know I’m a bit of a frustrated architect. I love building design especially huge-scale projects like skyscrapers and massive bridges as anyone who’s checked out my tiny book collection will attest. But I also like smaller home and office stuff too because great design examples stand out like elegant fingers. Sadly the reverse is also true and our towns are full of really badly-designed or incongruously-sited buildings. I’ve done more than a few postings on these over the years. But I’ve been studying an office building they’ve been renovating across the road from us here in Twickenham and I have to tell you I’m baffled by its design. Well last Friday turned into a really interesting day. First off I caught up with my old buddie C with whom, you may recall from a recent posting, I’m hoping to collaborate on a script for a comedy programme. We met in the riverside cafe at Tate Modern for reasons which are probably already apparent. C had been working on an idea for the last few weeks and it was my first opportunity to go through it. I have to say it’s a great concept, funny and terrifically well-written. It’s based on things we can draw upon from the past both work-related and personal experience. So we’ve got a lot of source material to mine. I did offer some honest and, hopefully, constructive thoughts which got us into some sensitive areas but we’ve worked through that and are ploughing ahead on developing the script further and doing some essential background work. Who knows where it will lead but it’s great to be working on something creative and collaborating with my old mucker again. I’m sure it’ll be tempestuous at times but pretty exciting too eh. One of the things we noticed in France was the popularity of the Dacia range of vehicles. I guess it’s not too surprising given that Renault bought out the former Romanian state car brand a few years ago. The cars are famously affordable and very much aimed at the budget end of the market. Fair enough and by all accounts they’re doing good business in France, Bulgaria, Turkey and all sorts of places. The vehicles look a little like they’re designed by British Leyland’s Allegro stylists but I’ve nothing against them. Except the names they’ve come up with for the range. Now very old readers will know that I’ve written on the subject of car naming in the far-off past; it’s something of a thing of mine. I especially enjoy really crap vehicle names and the marketing men at Dacia (who must have been recruited from Bucharest’s top hardware and ironmongers store) have come up with some lulus. Well we’ve just returned from a super family holiday with my lovely daughters and son-in-laws and great grandsons spent in a delightful old farmhouse down in the Lot valley. Everything went beautifully and we had loads of fun, great weather, and nice food and wine. Sadly all great holidays are over much too quickly and we spent the last couple of days driving back. Yesterday we were en route to Calais from our overnight stop in Compiègne and we had a little bit of time to spare. We’d pulled off from the autoroute and headed to Arras to get some shopping from a Leclerc supermarket. Having done that we headed on the A road up to Bethune before picking up the A1 again. En route we passed several of the war cemeteries which pepper this part of N France. 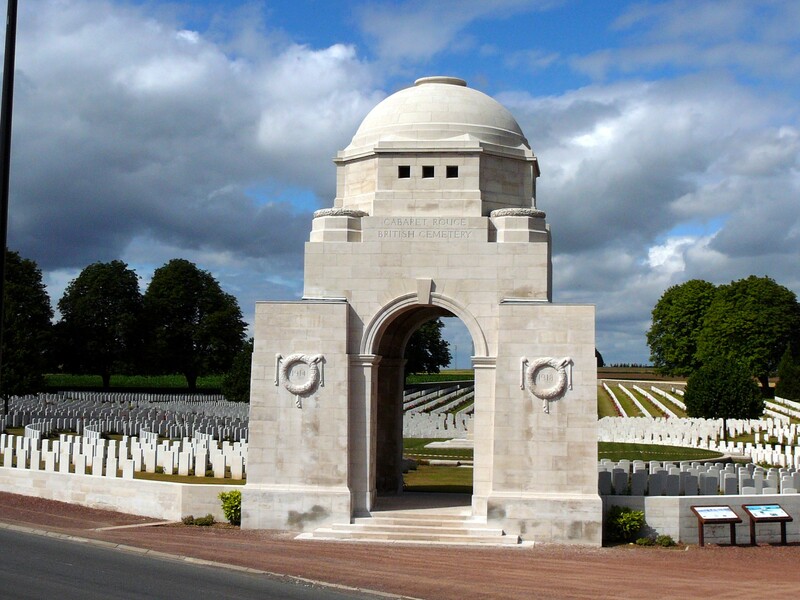 I passed the turning for the one at Vimy ridge which I fancied seeing but the traffic was heavy behind me so reluctantly I continued on for short while and came across the British cemetery at Souchez called Cabaret Rouge, named after a former cafe on the site. It looked beautiful and I pulled over for a walk around. Now I’ve been meaning to visit a First World War site for ages. It may sound a bit dark but the reason is my grandfather saw action in this area losing his leg and killing several of his unit colleagues when he triggered a German mine’s trip wire. He returned home from the war badly smashed up physically and emotionally at the age of just 17. It’s staggering when you think what these young men endured. I was talking to my son-in-law about it on holiday. He had a bit more time on the way back and he and my daughter and the boys were planning to visit Ypres to witness the last post which sounded cool. 2014 is the 100th anniversary of the outbreak of the terrible war after all so what better time to make a visit? I wasn’t disappointed by Cabaret Rouge. It contains nearly 8,000 graves – it’s nowhere near the largest but the sight of all those pristine white headstones is just so moving. The British soldiers buried there were mostly from London regiments and there were many headstones for fallen Canadians. So many of the graves were for unknown soldiers. I couldn’t believe just how many there were. I have to say the Commonwealth War Graves Commission do a fantastic job keeping these cemeteries in stunning condition. We were the only visitors and spent some time just walking round taking things in. It is a poignant sight and I had a moment or two to think about my grandfather and all these men who made the ultimate sacrifice so that we and my family have the freedom today to visit France on holiday. Nobody spotted but I got a little, er, reflective.